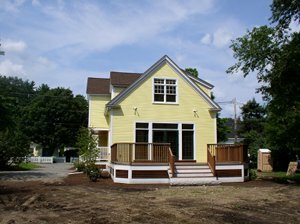 Invest in a quality home addition builder in Manchester MA you can rely on. O’Neil Fine Builders has serviced the North Shore since its founding in 1990. We would love help create that extra living space you want and need, while also increasing the overall value of your home. With our in-depth design-build services, O’Neil Fine Builders handles your addition from start to finish. Contact us today to schedule an appointment. Do you need assistance with design planning? O’Neil Fine Builders will gladly develop detailed blueprints to your satisfaction. That way, you know exactly what your project will entail. Call today to schedule an appointment with a home addition builder in Manchester MA. O’Neil Fine Builders is ready to begin your custom home addition in Manchester MA. Founder Jim O’Neil oversees all projects to ensure your 100% satisfaction. Use the contact form to your right or call us at 978-927-7711 to schedule your appointment with one of our Manchester MA home addition builders. .